Imagine a system of justice in this country that strips its citizens of their Constitutional rights, voids their existing legal documents, gives others the right to spend their money and sell their assets, isolates them, and has the ability to limit the time they can spend with their loved ones. While you may be thinking of the criminal justice system, the previous description refers to a parallel system that preys on the elderly and is determined to deem them unable to care for themselves. It is a system that allows those in control to take full advantage of their “wards of the state”—legally and under the watchful eyes of judges. It is called guardianship. The book begins by looking at the history of guardianship—from ancient times till today. It then provides a clear overview of how this system is set up to work—from the triggers that set it off to the different groups of people that make up the process: the judges, the guardians, and all their associates. The book goes on to detail the responsibilities given to these players and describes how easily they can manipulate the system to their own advantage. It also presents an accurate picture of just how difficult it is to free a family member from the system. There are things loved ones can do to fight the system, to be sure, but many obstacles and pitfalls await them in the battle. This book is meant to prepare the reader for these eventualities and includes a comprehensive glossary, a helpful resource section, and a number of documents that may prove useful in the pursuit of real justice. Sam Sugar, MD, is a medical doctor and a founder and president of Americans Against Abusive Probate Guardianship (AAAPG), an organization designed to help expose the corruption of this nation’s guardianship systems. Dr. Sugar received his MD from the Abraham Lincoln College of Medicine at the University of Illinois, Chicago. He achieved certification as a specialist in internal medicine from the American Board of Internal Medicine and was distinguished as a fellow of the American College of Physicians. He has served as the director for managed care at Evanston/Northwestern Healthcare, and has taught at both Northwestern University’s Feinberg School of Medicine and the Chicago Medical School. In 2014, after experiencing the horrors of guardianship firsthand, Dr. Sugar and Ms. Lidya Abramovici, another victim of the system, teamed up to create the Americans Against Abusive Probate Guardianship (AAAPG). Currently, Dr. Sugar lives in Hollywood, Florida, with his wife, Judy. "Dr. Sugar has provided an invaluable service to the public by writing Guardianships and the Elderly. As an elder law attorney, I highly recommend this book to anyone who is over the age of sixty, who has friends or relatives over the age of sixty, or who cares about seniors and the disabled. This book is well-written, easy to understand, and is an extremely informative work that will be an invaluable source of information for those who want to learn about the inner workings of guardianships and conservatorships." —Cheryl Mitchell, Esq. "Years ago when I began fighting for changes to the deplorable situation in the guardianship system for the elderly within Nevada, it began as a one-month editorial and grew into what is so far a four- year Odyssey. The battle raged on across our state from Clark County to the legislature in Northern Nevada, and our "rag-tag team" won many battles. Suddenly, we were not fighting alone as our goal came to spread the word across the United States . . . we heard about a man by the name of Dr. Sam Sugar, who has picked up the banner and marched on and leads the challenge for our most vulnerable. Hopefully, after reading his new book more people will know how not to fall victim to “Isolate . . . Medicate . . . Steal the Estate” . . . Vegas Voice-Elder Hub is proud to be part of Dr. Sam's efforts. Congratulations on your new book, Doc." Exposing a monolithic scheme that exploits people just like you can be a very lonely undertaking. Writing a book like this is also a very personal experience. In my case, I was able to draw on the people and incredible stories I’ve been dealing with in my role as founder of Americans Against Abusive Probate Guardianship (AAAPG), as well as the advice of my parents. My experience in the practice of internal medicine for over forty-five years was instrumental in helping me understand the fallout, both physical and emotional, of being involved in this egregious “industry” of elder abuse. My parents survived the Holocaust, making me a second-generation Holocaust survivor—an identity that I have only recently begun to embrace, but one that surely influenced my determination to expose this governmental scheme that destroys people and families. My parents taught me the nobility of fighting against all odds to survive. They insisted that their children—myself and my two brothers, David and Michael—always comport themselves with integrity. Although my parents were not the beneficiaries of higher education, their strength of will and purpose made them seem far more noble to me than any of my very highly educated circle of friends and colleagues. I became passionate about this subject and decided to write this book after having been exposed to the guardianship process through the experiences of a loved one. I witnessed how overwhelming the guardianship process can be and how seemingly impossible it is to prevent or stop. This ordeal introduced me to outrages that I have since seen repeated countless times in the American professional guardianship industry. I hope that through this book those suffering as a result of guardianship will derive some solace, and that this scheme will now become something other than a secret weapon unleashed on so many individuals and families. Early on, I developed a relationship with the late Latifa Ring, whose own personal experience with guardianship ultimately killed her with what I believe was a stress-induced malignancy. She was one of the first people to recognize the evil nature of guardianship and fought with every ounce of her being against it. Attorney Ken Ditkowsky, from my hometown of Chicago, is another advocate who continues to expose the evil that is abusive guardianship. His vast experience in the law has been of great assistance to me in understanding the nuts and bolts of what guardianship should be, as well as what it actually is. I met Lidya Abaramovici by accident and found that we had both suffered from the slings and arrows of guardianship. We developed a wonderful working relationship. Without her, none of the accomplishments of our group would have been possible. She is a dynamo and a true warrior for justice. Another warrior is Doug Franks, who spent every waking moment of his life fighting for the freedom of his mother, Ernestine, until her passing, and even since then. He endured threats of incarceration and enormous monetary sacrifice to let the world know what guardianship did to his mother and family. Driving around all of Florida with his “Free Ernestine” banner prominently displayed on his car probably brought more attention to this cause than anything else. Lynn and Alan Sayler have been unwavering supporters of our work. They are committed to seeing justice done for victims like Lynn’s mother, who died in guardianship. Attorney Greg Coleman, former president of the Florida Bar Association and a member of the Judicial Qualifications Committee, has been generous with his time and advice since the week he became president of the bar. He showed compassion and understanding of the issue and has always been a friend and a resource to me. John Pacenti, an extraordinary investigative reporter in Palm Beach, Florida, called me at the very beginning of my journey in guardianship and wanted a story from me about the subject. At the time, I was so terrified that I refused to speak to him or give him my full contact information. He persisted and, some time later, he and I began a collaboration that has spanned half a decade and resulted in the most striking exposés of the abject corruption in Palm Beach Circuit Court. John is a brave and courageous man who stands up for the truth and for people who have been so badly injured by the court corruption he writes about. I am honored to call him my friend. Attorney Michael Schlesinger of Miami, Florida, has allowed me to retain a little faith in the legal profession. He has done his best to help my family and the countless others who have been referred to him. His candor, professionalism, and diligence were exactly what we needed in a time of desperate legal peril, from which he helped us escape with his expertise in our appeal to the third District Court of Appeal in Miami. From the time I met her near Orlando, Florida, where we filmed our documentary Broken, Kelley Smoot Garrett has been a brave, wonderful, and dedicated colleague. Her energy, skill, and dedication are endless. Without her and her expertise in IT, our message would have reached far fewer people. A very special thank you to my great friend Jon Huntsman Sr., whose generosity and faith in me allowed for the creation of AAAPG and all it has accomplished. I want to thank Ally Cirruzzo and Michael Weatherhead, my editors, as well as Anthony Pomes, at Square One Publishers, for their tireless work on this project. Their patience and skills were the glue that held it all together. The victims of abusive guardianship who call us for help deserve recognition as well. I hope that over time, the number of victims, the number of guardianships, and the number of horrific stories will decrease. My wife Judy is a special woman. Her strength of character and love for me sustained me in times of trouble. Her courage and wisdom in the face of adversity has sustained me and given me hope. Without her love and support this book could never have been written. I love and treasure you, Judy. This book is in honor of you and in loving memory of Chayele. There is a powerful guardianship industry in the United States, but, for the most part, its power is unknown and unchallenged. Dr. Sam Sugar, more than anyone else in our country, is expanding public awareness that the industry is broken and needs to change. Our country’s history is full of calls to increase our civic awareness. President Dwight Eisenhower warned us about a dire threat to democratic government known as the military-industrial complex. Rachel Carson’s Silent Spring, published in the summer of 1962, informed us of the adverse effects of pesticide use on our environment. Martin Luther King Jr.’s “I Have a Dream” speech deeply affected us and called us to live up to the principles this country is said to espouse. It is the hope of many—including myself—that Guardianships and the Elderly will prove to be a similar catalyst for change. It takes courage, commitment, and sacrifice to speak out. Deepseated institutional power coupled with the veil of secrecy make guardianship industry abusers potent foes, and those who challenge such abuse generally find few allies. Nevertheless, widening public awareness is a key ingredient to facilitating positive developments. This book, both an indictment of a troubled system as well as a principled call to action, is a terrific resource for families, media outlets, and legislators who wish to fight for a better way. It is a powerful resource that exposes a structure in need of being remade. Dr. Sugar is the founder of Americans Against Abusive Probate Guardianship (AAAPG) and a recognized national voice in challenging the widespread abusive practices of those who are supposed to protect our seniors. Moral necessity and demographic shifts demand reform. The United States has some 75 million baby boomers, 10,000 of which reach the age of 65 every day. The boomer generation, greatly invested in social change since its youth, can now be a powerful source of change in its advancing age. Calls for new laws to protect seniors against guardianship abuse combined with growing awareness make the baby boomer generation natural allies of those calling for significant changes to the guardianship industry. It has been my pleasure in life to know people who, sometimes at great personal cost, make a difference in the lives of others. Dr. Sugar is surely one of those people. My personal heroes are always people like Dr. Sugar: courageous, committed, and clearly focused on making things better for other people. Identifying the spark that sets off such commitment is not always easy. In Dr. Sugar we are given some strong hints. He is a second-generation Holocaust survivor, a child of parents who taught him the nobility of fighting against all odds to survive. I’ve seen such nobility before, in those who deserve our society’s highest regard but for whom this regard has not yet been granted: a granddaughter of an American slave, a person with overwhelming physical disabilities whose greatest concern is for those around him, and a chronic Good Samaritan whose life was ended by a drunk driver. It is vital to remember people who sacrifice for others, those who fight against what seem like unsurmountable odds. I first met Dr. Sugar when he contacted me about my book, The Wolf at the Door: Undue Influence and Elder Financial Abuse. We talked about the book and how it represented my own effort to make a difference in the way our society approaches the protection of elders from financial abuse. Through our conversations, I learned more about him and his national leadership in shining a light on the personal and familial suffering occasioned by guardianship abuse. Abusive guardians unchecked are well past the elder’s door—they are in the house. I’ve been a lawyer for over forty years. Given my professional background, I was drawn to the observations about lawyers and guardianship cases Dr. Sugar makes in this book. After noting that guardianships are fueled by family disputes, he writes that “litigators representing all sides can take full advantage of these situations and may even intentionally stoke the flames of discord, all for the one thing that drives them: legal fees.” I’ve seen this up close, unfortunately. Not all guardianship cases involve this kind of misconduct, but when one does it is disquieting and disgusting, and amounts to a blight on my profession. It feels dirty to sit at a table with lawyers who seem to have forgotten the people they are supposed to serve. Professionals charge fees; this is an economiC reality. But neglecting the needs of clients and gouging them with exorbitant fees should not be a reality. I credit Dr. Sugar for identifying this very serious problem. I think that Dr. Sugar’s book will profoundly influence people’s lives. The more attention this book receives, the more lives will benefit. I don’t say this to add dramatic flourish; it is the simple truth. There is great meaning in this book. It is a clarion call to our better selves—those selves who will speak and act against abusive power. I wish I had never heard the term “guardianship.” I wish the facts and stories I am about to share had never happened. But as Albert Einstein said, “Those who have the privilege to know, have the duty to act.” Thousands of unsuspecting, well-meaning Americans have experienced life-altering abuse at the hands of a little-known and poorly understood court-based system known as professional guardianship. The kinds of injustice, expense, and despair that I have personally witnessed in Florida’s probate court system—where thousands of guardianships are handed out every year—continue to be experienced by so many families across this nation. Initially, we thought our experience must be a one-of-a-kind horror show that was just our bad luck, an unfortunate series of circumstances, an exception to what we believed to be an honest and just court system. But over time, as we came across more and more victims of professional guardianship abuse throughout our home state of Florida, and then throughout the country, we realized this unfathomably horrible process was all too common. At a certain point, I knew something needed to be done to draw attention to what was going on, so in 2012, I decided to take matters into my own hands. I formed Americans Against Abusive Probate Guardianship (AAAPG) with the goal to “educate, advocate, and legislate” for families caught up in probate exploitation. The organization’s goal is to raise awareness of the threat of abusive guardianship and fight to eliminate these abuses. Gradually, as I was exposed to dozens and then hundreds of cases of guardianship abuse as founder of AAAPG, a recurrent pattern of events emerged that shocked me. It seemed that judges, guardians, and lawyers in courts across the country had developed a systematic playbook to be used in generating and perpetuating immensely lucrative, professional guardianships. These professionals essentially guaranteed guardianship industry insiders easy and total access to the lives and assets of unsuspecting individuals who potentially needed help managing their affairs or their health because of something called their “incapacity”—their putative inability to function safely on their own. I slowly learned that there is something terribly wrong with the American guardianship system. The imposition of court-imposed involuntary professional guardianship is all too often merely a devious, slick ploy—an arcane, poorly understood legalistic court process that perverts existing laws meant to protect the vulnerable into an exploitative system. The more time I spent studying this issue, the angrier I got. I simply could not believe that there was a system in place in this country that could strip innocent individuals of their constitutional rights, seize their assets without due process, and relegate them to living the rest of their days under the total control of other people. Even worse, often these guardians know nothing about their court-appointed wards but have unfettered control over their savings, property, healthcare, and virtually every other aspect of their lives. I simply could not understand how any component of our legal system could possibly turn a blind eye to such cruelty. I (and many others) wondered how it could be happening in the United States. What I learned is that it happens all the time. This nationwide system of abuse is rapidly expanding, posing a stealthy but very real threat to older Americans and their families. There are millions of individuals in this situation in America. The statistics on guardianship that would allow legitimate study of the issue are intentionally kept hidden from the public. Legitimate complaints about guardianship have fallen on deaf ears at every level of our government for over forty years and continue to fall on deaf ears in state capitals and Washington, DC. The normal sets of checks and balances that our government depends on to retain its legitimacy simply do not exist in guardianship “equity” courts. On my personal journey, I have met and befriended important leaders in the legal, judicial, and legislative communities who are convinced that reform is urgently needed. But I have also come across very powerful groups in these same communities that are determined to prevent reform and keep their industry flying under the radar at any cost. This system, which long ago may have been set up to protect the most vulnerable people in our society, is now a massive, well-organized, for-profit business. Court insiders will always fight tooth and nail to protect their turf, their power, and their easy access to your family’s money. Along my journey I have also encountered many hundreds of fine people, honest people, loving sons, loving daughters, and relatives of victims, all of whom have suffered enormously as a result of the guardianship system. The stories they have shared with me are all similar tales of physical, financial, and mental torment. I hope this book sheds sufficient light on this system run amok, which has allowed guardianship courts to be controlled by the very people who profit from their protected positions. I also hope it teaches you some important tips that might help you avoid this process, shield your loved ones and yourself from its painful results, or pursue legislative changes to the guardianship system in your area and across the country. We all pray for long life in hopes that our golden years will be spent in comfort, harmony, and peace, and that the assets, money, and property we have accumulated over our lifetimes will be distributed to or inherited by our loved ones as we wish and see fit. But in America, no matter how well you have planned, no matter how painstakingly your estate plan has been created, no matter how much you have or do not have, there lurks a serious, shadowy threat to every elderly citizen’s well-being and the execution of their end-of-life wishes. Worse, it is a threat that is rapidly growing throughout the country and leaving in its wake plundered estates, broken families, and the shattered lives of those who have been deemed “incapacitated.” This threat is called professional guardianship, and unfortunately, the quote above aptly represents the feelings of many of those who have experienced this all too powerful court-based process. There is a good chance that the average American has never heard of the legal process involved in imposing and carrying out guardianships. It is also likely that you equate the term “guardian” with the word “protector.” And as a legal process, without a clear understanding of what a guardianship actually entails, it would likely conjure up something designed to help people in need—a process in which a court is able to see after the welfare of an individual. However, once a family becomes embroiled in the actual process of a professional guardianship, a true picture emerges of a process that would, in any other circumstance, be deemed illegal and certainly unconstitutional. While there are various types of legal guardianships, the ones we will focus on in the coming chapters are professional, forprofit guardianships (also known as conservatorships and simply referred to in this book as “guardianships”) in which a court hands over absolute control of the life of a person who has been procedurally and legally deemed incapable of adequately taking care of him or herself—and who has assets. These assets can include homes, savings and brokerage accounts, jewelry, and social security payments, as well as any property of value. The judges and courts that manage and implement this system as part of the judiciary in every state are governed by statutes and special court rules unique to each one. These rules, regulations, and standards are interpreted and administered under the direction of a specific kind of court and, in many cases, by specific judges. Generally, it is the state probate court that deals with adult guardianships. Although probate courts may be referred to by different names from state to state, their tasks remain essentially the same. 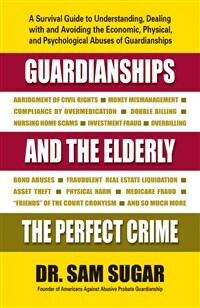 These tasks include responding to and establishing the need for a guardianship to be put into place; selecting the guardian or guardians to oversee and manage the ward’s finances, living conditions, and healthcare; monitoring and/or setting fees and living expenses taken from the ward’s assets; monitoring the guardian’s duties and obligations; and ending the guardianship expediently based upon a legal proceeding or upon the death of the ward. On the face of it, a guardianship sounds reasonable. A ward, whom the courts deem as unable to take care of herself under this system, can be looked after through the care and guidance of a court-appointed professional guardian. Any costs involved would be paid for by simply withdrawing funds from the ward’s assets under the watchful eyes of the court administrators. The ward would be safe and protected from exploitation, abuse, and neglect, and her family relieved from the work of caring for an elderly person, all under the watchful supervision of a benevolent judge. Sounds good! As you will see, these professional guardianships have become immensely profitable sources of income, not only for the guardians and the people they hire, but also for the lawyers and judges who oversee the process. The profit motive that now drives the professional guardianship system relegates actually providing care and support for an elderly person to a minor, trivial matter. So often, wards’ basic needs are of little concern to the busy guardian. Many wards are routinely handed off to inexperienced low-level caregivers, whom they depend on for their very existence. Amazingly, the ward’s family, who no longer have any control over her life, can only watch to see what living facility or nursing home she is placed in, who her doctors are, or which medications she is prescribed. Even if the ward has legally set forth her wishes for end-of-life care and inheritance distribution prior to the establishment of the guardianship, those documents are no longer enforceable under the rules of guardianship. For the families, it is a terrifying and helpless feeling—multiplied a thousand-fold for the helpless piece of property known as the ward. It may not seem like this could happen in the United States, but it goes on every day through the guardianship programs in place throughout the country. So why have you not heard of these abuses? The fact that you have not may very well be by design. Patience Bristol of Las Vegas, Nevada, a former professional guardian who is now in prison after pleading guilty to exploitation of a vulnerable person. She “tapped the accounts of her [four] wards to cover her sizable gambling debts and personal expenses,” totaling $495,000 in just one case. April Parks, also of Las Vegas, a professional guardian whose criminal sentence is pending after an $8.5 million-dollar civil judgment. Paul Donisthorpe of New Mexico, who was convicted after stealing millions of dollars from the elderly and disabled through his trust company, Desert State Life Management. He was sentenced to eight to twelve years in prison and must pay over $4 million in restitution to the victims of his crimes. On the other hand, if you are familiar with the injustices of guardianship, you and your family may already be one of the thousands of people entangled in this unfair system. And the likelihood of being involved in a guardianship is increasing daily. Ten thousand baby boomers a day are turning sixty-five years of age. Projections based on demographics alone predict an enormous increase in the number of individuals with dementia or other forms of incapacity who will be trapped in involuntary guardianship over the next five to ten years. As many as one million new American wards have been created in the last decade alone. I am a guardianship family survivor, a board-certified specialist in Internal Medicine, an advocate for the elderly, and a certified guardianship examining committee member. I have witnessed firsthand and studied in depth the many glaring flaws in the way allegedly incapacitated individuals are treated in this bewildering court-based system of intrusion into the personal lives of innocent citizens. As founder of Americans Against Abusive Probate Guardianship, I have had the opportunity to attain an in-depth insider’s knowledge that, through the countless personal stories of our subscribers, paints a terribly disturbing picture of American guardianship so vividly. By telling those stories and the lessons learned from them, the average citizen can better understand what is, by design, an incomprehensible system so powerful as to rule over life and death. Guardianships and the Elderly is the result of the combined efforts of myself and my dedicated colleagues to make this information public and accessible. The information you will find in this book is designed to provide a clear picture of how this system works and how it does not. You will be introduced to two very different perspectives of modern-day guardianship in the United States. First, to understand guardianship and how it has evolved, you will learn details about what guardianship statutes were intended to accomplish—the way the system is supposed to work. But from a second, very real life perspective, you will learn how this complex and sometimes brutal system actually does work. The discrepancies between these two perspectives are glaring. We will examine the critical differences between the types of courts that function as courts of equity, rather than courts of law. This critical distinction is what allows probate courts to function without juries and without any oversight or discipline. These courts and the judges who rule them are fully responsible for monitoring and disciplining guardians they appoint, but as you will see, there are innumerable conflicts of interest that impede the ability of the court to perform its work properly. Next, we will explore the reality that guardians across the country are not licensed or meaningfully supervised in any way, and more importantly, often have little or no formal training, education, or background in the complex task of taking total responsibility for the life of the ward assigned to them. We will examine the guardian’s roles and see how they are trained, supervised, and disciplined. Then we will delve into the world of guardianship attorneys and understand how their connections to guardians and judges allow them to reap rewards for the mountains of paperwork they create, which do far more to protect the guardians than the innocent, vulnerable individuals. We will analyze the guardianship industry court insiders and their numerous downstream stakeholders, and why they are able to so greatly profit from the assets of wards. You will learn what happens when anyone, including family members and even lawyers with years of experience, attempts to protest against seizure of civil rights and assets by the judges in charge. You will also discover some of the most common traps in the legal maze that disadvantage the uninitiated. Finally, I will present critical tips to prevent abusive guardianships and suggestions for how to effectively rescue a ward trapped in one. This information is critical to every member of your family—because this guardianship catastrophe could easily happen to you. I offer this book to shed light on this powerful industry, so that potential wards and their loved ones can be better educated and prepared to protect their loved ones and even prevent an unnecessary guardianship from ever taking place. So let’s begin to understand how this all came to be.